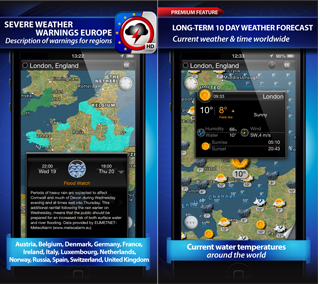 eWeather HD is a visually stunning, feature-rich weather forecast app and widget for iPhone and iPad, Android. Get instant access to 10-day weather forecasts, current conditions, high-resolution NOAA radar, satellite weather, NOAA buoys, USGS/EMSC earthquakes, NWS/Meteoalarm severe weather alert bulletins. Weather forecasts are provided by well-known weather sources (WSI corp. and Foreca.com) and available for almost any place in the world. Planning a day at the beach or a boating trip? Are you curious about what the water temperature is at your favorite place to swim? 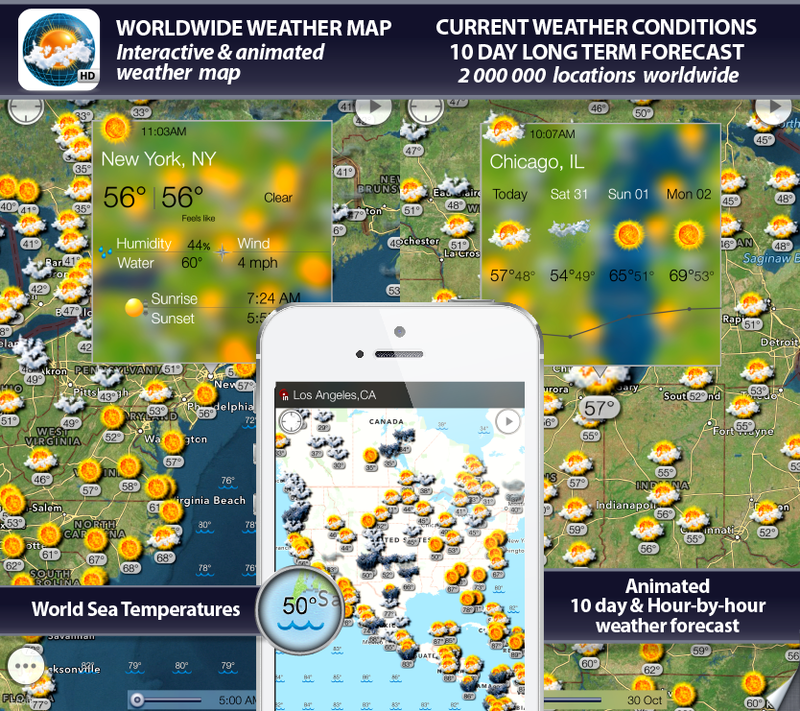 World Weather Map HD is the fastest, easiest-to-use, weather application that displays current weather conditions and sea surface temperature directly on the map. Additional information, presented in pop-up window, includes “feels like temperature”, humidity, local time, sunset, sunrise time, wind speed, wind direction and ten-day weather forecast. Are you planning a vacation trip or other activities for which you require weather-information? Planning a trip next summer? Traveling through the US, Europe or Asia to places you have never been to? Organizing your daughter’s wedding next year? Scheduling an important outdoor event? 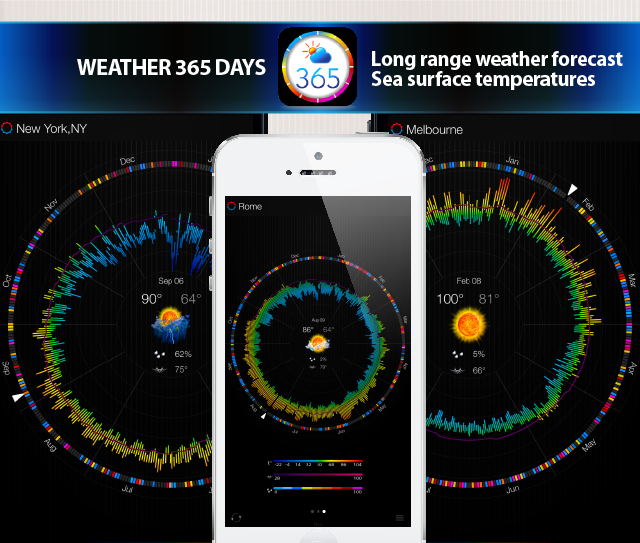 Weather 365 is an indispensable weather app for iPhone and iPad that provides long-range year-ahead weather forecasts based on a historical weather data. The app presents its information in an amazingly intuitive format, with a simple, user-friendly interface and single-touch access to weather trends, ranging from a single day to a year. 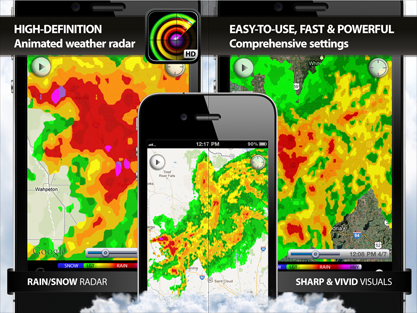 Radar MAX is a great application for iPhone, iPad and iPod touch that displays high-resolution animated weather radar around your current location, allowing you to quickly see what weather is coming your way. Radar shows tornado, rain, winter storm and hail clouds movement on zoomable maps around your location in real time. The data is provided by NOAA's National Weather Service. Available on Android, iPhone, iPad and iPod. The Buoy Finder app provides users with access to live data transmitted from over 700 buoys scattered throughout North America, Alaska, Hawaii, Canada, Europe, and the Caribbean. Most buoys provide information about current wave heights, wave periods, wind speed, wind direction, air temperature, water temperature, atmospheric pressure, pressure tendency, and dew points. Buoy Finder also uses satellite scanner to obtain global sea surface temperatures (SST). Cyclone is a storm / hurricane / typhoon tracker app that displays projected paths (International and Global) and animated images of clouds around your current location, allowing you to quickly see what weather is coming your way. Satellite images provide an excellent view on the clouds in the sky and an indication of the weather over the North American continent, Europe, Japan, Australia and Indonesia. 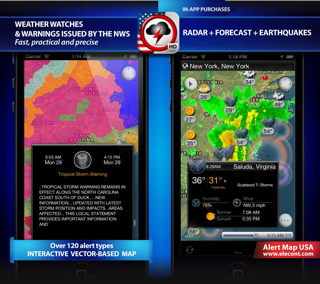 Weather Alert Map USA, is a breakthrough free app for iPhone and iPad that alerts you of significant weather events including watches, warnings and advisories using beautiful color-coded vector-based maps. The app provides life-saving information for careful families, outdoorsmen, boaters, vacationers, enthusiasts, travelers, and virtually anyone. As everyone knows, the weather isn’t finite and it can change. With Weather Alert Map USA you will see those changes quicker than waiting for someone to announce it on the radio or the TV. The app provides a summary of all the severe weather hazards respectively severe weather warnings as well as useful weather advices for Europe. Vector-based maps allow to get accurate areas affected by weather-related extreme events (or forecasts of these extreme events). Severe weather maps and bulletins now available for 13 European countries including Austria, Belgium, Denmark, Germany, France, Ireland, Italy, Luxembourg, Netherlands, Norway, Spain, Switzerland, United Kingdom and Russia. 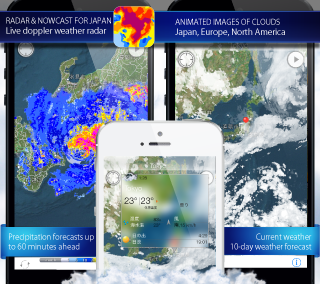 Radar and Nowcast for Japan is an iPhone and iPad app that displays echoes and precipitation forecasts up to 60 minutes ahead are displayed in 1 km x 1 km resolution every 5 minutes, respectively. Precipitation Nowcasts provide precipitation intensity forecasts of swiftly growing convections with a spatial resolution of 1 km up to an hour ahead to assist with disaster prevention activities. A Six Star App on a Five Star Scale! I have used alot of weather app... This one is my favorite now. Why? 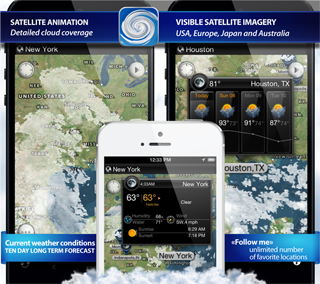 It has enough information to be useful and give a full picture of the weather without getting way too technical. It looks pretty without being flash over function. It's accurate. First, it uses one of the best, if not the best forecasting services. They have one of the top percentages, at least for my area, for getting it right. (The app also allows you to choose Forca to give forecasts but they are based in Europe so not good for the States.) The most important thing a weather app should do is give you good information. Second, it gives you a variety of information. You get highs and lows, of course. You also get barometric pressure. This is something a lot of apps leave out, but it is one of the best indicators of what the weather is doing! You get sunrise/sunsetsfor, chance of precipitation, the temperature, trend, current conditions, hourly forecasts for the next 12 hours, wind, humidity and a 10 day forecast. Not enough? You get the "feels like" temperature, a screen for radar and some toggles to see hourly conditions for stuff like chances of precipitations. It's a great app! Plus you can see weather alerts and even earthquake reports. I used to keep a variety of weather apps so I could have a second opinion more information. No longer. I haven't opened another weather app for over a month. I deleted them last week. 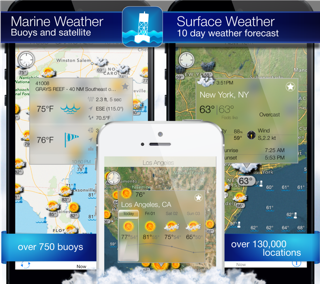 If knowing the weather conditions and forecast are important to you, then this is your new app. You won't regret this purchase. Ein sehr schönes und gutes App. Bin sehr sehr zufrieden. Kaufen Leute ihr werdet positiv überrascht sein. Le ho provate quasi tutte le applixazioni meteo, ma questa è l'unica che mi soddisfa. Sehr schön gestaltete Benutzeroberfläche, leicht und intuitiv zu handhaben und auch die Wetterdaten stimmen! Like checking the weather, bit of a British thing. This app has everything you need, plenty of info, very good interface and I probably haven't found all the features yet. Пробовал использовать разные программы. Думаю эта лучшая. Как метеозависимые люди мы следим за изменением давления, что действительно часто совпадает с изменением самочувствия. Точный прогноз и красиво, что важно для дисплеев ретина. Удобная вещь - наклейка на значке , которая показывает температуру.